Want to see Sable Island’s wild horses? 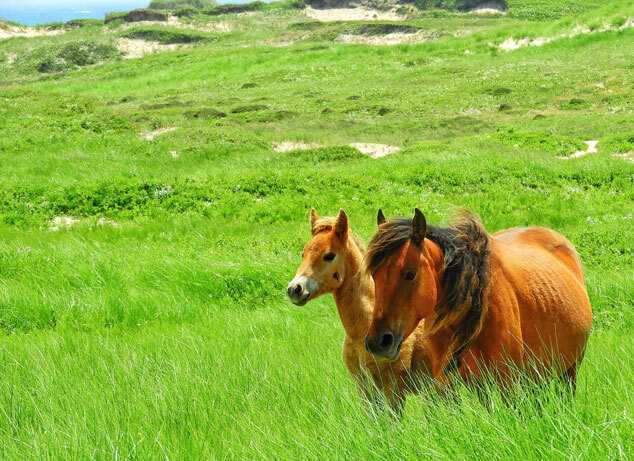 Sable Island is one of Canada’s coolest Park Canada sites. It’s hard to reach but for those who make the effort, they will get a few hours with the world’s most isolated wild horses. Learn more in my latest story for Fodors.com here. Two of the most talented travel writers I know – Debbie Olsen and Leigh McAdam – have turned their considerable talents to ferreting out 125 of Alberta’s best destinations for nature lovers. Their new book “125 Nature Hot Spots in Alberta” profiles parks, conservation areas and wild places across mountain, prairie, forest, and water landscapes. Each profile includes an easy-to-read summary of reasons to visit, activities available, months open, and physical and website addresses. The extensive consultation they have done with park managers and nature experts shines through in unusual historical and geographic facts on each location, tips on avoiding crowds, and suggestions for making the best use of time. 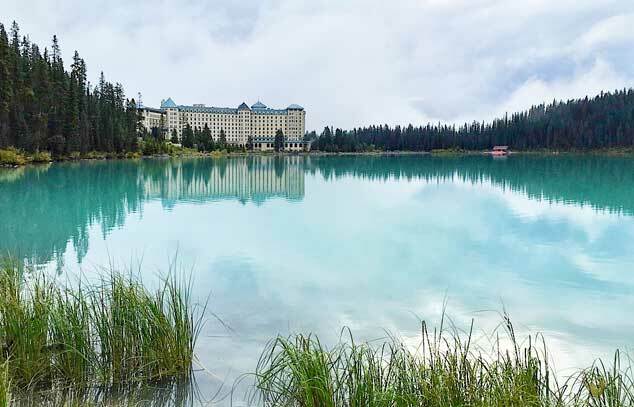 The book is a combination of well-known locales (Banff National Park) and undiscovered jewels (who knew McLennan proclaimed itself the Bird Capital of Canada?). As a bird lover I appreciated the book’s emphasis on bird and wildlife watching but there is plenty for those more interested in moving than observing. Hikers will enjoy tips on tackling a hiking route, cyclists the best direction to travel a route, and paddlers the identification of waterways suitable for beginners versus experts. People seeking caves, dark skies, hot springs, larch, nature festivals, paddling, and waterfalls will find a list of special interest places they can string together for a themed trip or check off as time allows. In all cases McAdam and Olsen stress the need to tread lightly as they point the way to sensitive environments. A separate section is devoted to special interests. Visitors to Alberta will find the book helpful if they want to go beyond places often featured on tourist brochures. Well-travelled Canadians will find it breathes new life into their vacations or weekend getaways. I’ll be keeping this book handy for years as I plan more outdoor adventures. Published by Firefly Books and available wherever books are sold online and in bookstores. 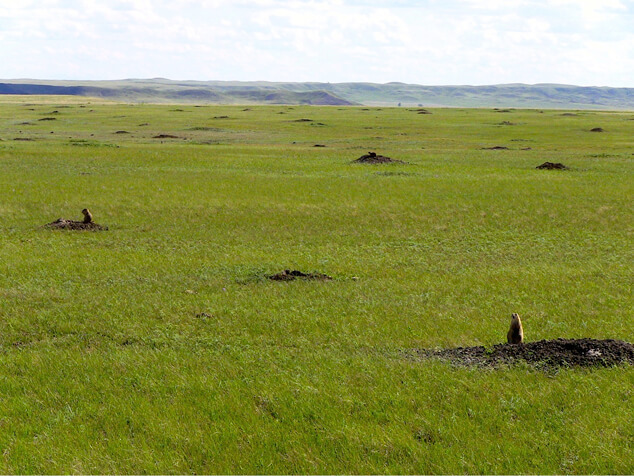 Book Review: 125 Nature Hot Spots in Alberta – Click to Tweet. My friend, @Reinventure, is sharing a book review on “125 Nature Hot Spots in Alberta” in her latest blog post. Discover all the details about this amazing book: Click to Tweet. Calling all nature lovers! 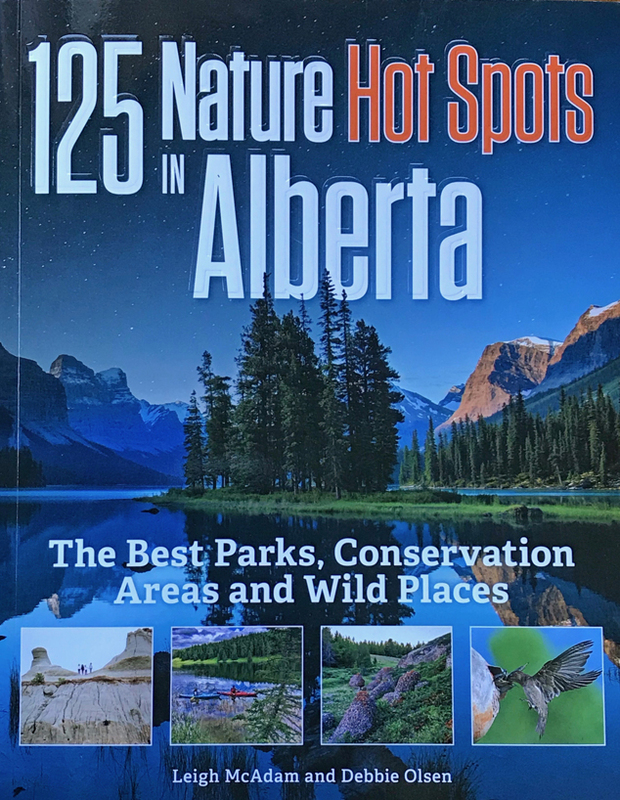 Check out this new book “125 Nature Hot Spots in Alberta” by 2 of the most talented travel writers out there, @hikebiketravel & @wanderwoman_Deb – Click to Tweet. Convincing people to pay for environmental sustainability sometimes takes a story. 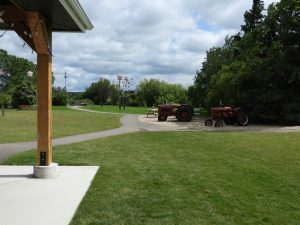 Ellis Bird Farm(EBF), one of central Alberta’s best (and free) attractions discovered bird brains can sway corporate thinking with the right tale. This story’s heroine is Amelia, two ounces of determined purple martin living in one of the farm’s many birdhouses. EBF became a magnet for birds when farmers Winnie and Charlie Ellis put out thousands of pounds of seed. When they got too old to keep it up they sold the land to a large petrochemical plant with the proviso the birds be looked after forever. Thirty years after Charlie and Winnie moved out, MEGlobal still funds EBF’s operating costs and EBF biologist, Myrna Pearman, keeps looking for ways to advance wildlife conservation and education. An alliance with Dr. Kevin Fraser and the University of Manitoba to put geolocators on purple martins was created to identify migration routes (something unknown at the time). Data revealed that the first purple martin to return (named after another great aviator, Amelia Earhart) had wintered in South America, taking several weeks to arrive but rocketed back to Canada in the spring, flying on average 600km every day for three weeks! Senior staff from MEGlobal’s Dubai office was visiting EBF in 2013 when this information was revealed, Amelia herself sitting nearby on a pole, her tiny appearance belying tremendous stamina but her story made an impression. At a MEGlobal meeting the next day it was decided to gift EBF with an additional $450,000 to build a new visitor center – a spontaneous gesture rarely seen in corporate governance. But the staff was so moved by Amelia’s story and the work done at EBF they wanted this tiny tourism attraction to reach even more people with bird stories. A few months later the new visitor center opened and the second great aviator to be named Amelia secured her place as a tourism influencer! Selling green tourism with a story. Click to Tweet. Learn how one bird named Amelia swayed corporate thinking. Click to Tweet. Discover how Ellis Bird Farm is continually advancing wildlife conservation & education. Click to Tweet. Parks Canada has a new app to make it easier to explore national parks and historic sites. With information on activities, events and places to stay you can make the most of your time on the road. 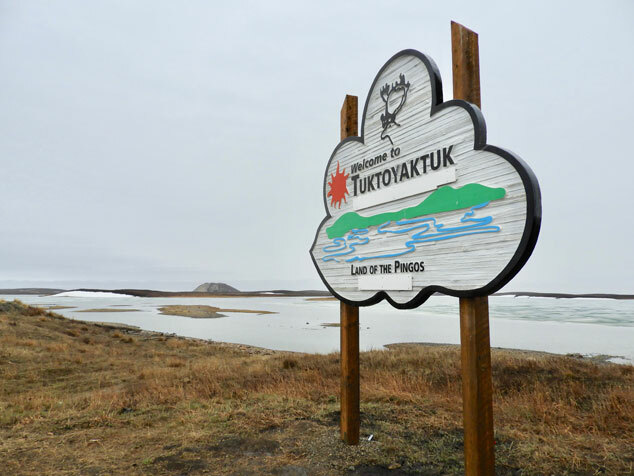 Parks Canada has offered up free passes for Canada’s 150th celebration so if you want to avoid the crowds, use this app to find the hidden gems – places that just as interesting or scenic but not as busy. The app will also let you quickly share your photos on Facebook, Twitter and Instagram.